Sunday rain. I feel the click of a traintrack switch undercarriage as the train flees on and scritch scratch out the letters of my destination on the white in front of me. H E X H A M. Short sharp ink strokes. A network of straight lines: letters fit for a timetable with their A to Z construction and efficient journey of shape. No meandering. Each letter precisely in its place, a passenger in its own six compartment carriage. Easy to breathe spacing, equally balanced link-and-pin syllables. Right on a luggage label. Smart on a seat reservation. Hexham. The heater at my feet burrs to life, spits dust for the first time today. Honeycombs. 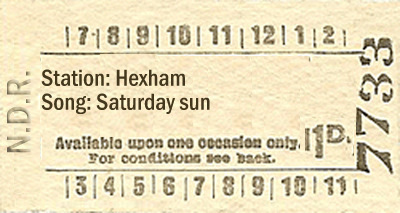 You could break Hexham apart, build a grid of sunny hexagons from that X and H and others. Take the lean of A, the abundance of M. Build beehives. A different order, but just as orderly. Fill them with bees and honey. Plant wildflowers nearby. Adjust eyes from black lines on ruled paper to the toasted smoke of this blurred yellow energy. Glooping geometric gold under buzz. Shining industry supporting melting amber activity. A haze of Saturday sun. Intoxicating hum and honeysuckle sweetness in the nose. Almost sickly. Honey and lemon. Cough drops, like the ones in my bag. They’re gilded too. Flu dreams; a hex, a pox, spells. My throat hurts. My hands are sticky. The sunshine was yesterday. No clear, blue skies this morning. There are no honeycombs, just steel grey drops of rain above the roof racks. The bees are going back to Hexham and I’m going with them. Hi Laura, I had the pleasure of reading this piece at the launch event. It’s probably my favourite in the collection.